Note the tight clearance to the beam. Last view inside the top before the ceiling slabs go on. Checking out the new Pisla 602 door. Very nice. Finally, an affordable 22" door with maximum glass. The have a double glass version planned for release soon. Lifting the first of the 3 ceiling slabs into place. Sealing the slabs together with silicone. help and it was a real learning experience for everyone involved. silicone, and then buried in mortar slush. the job to silicone only. 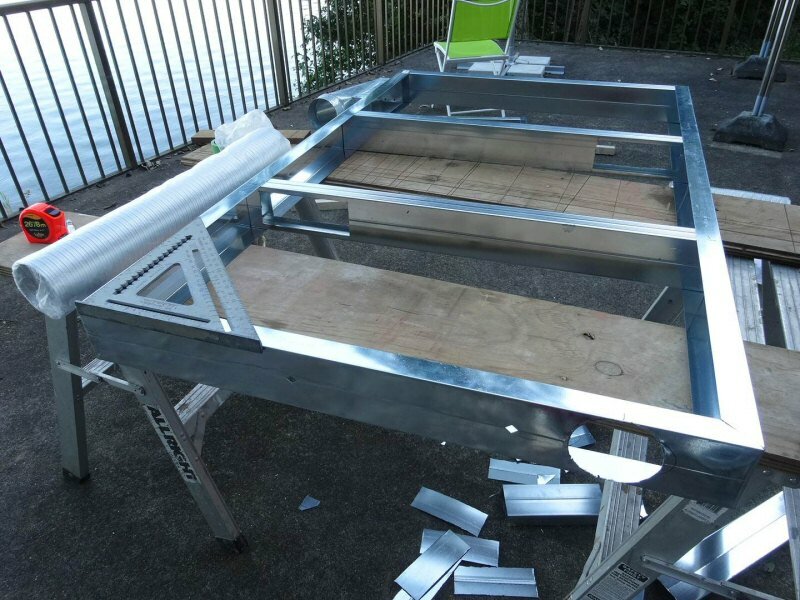 We had no sheet metal brake, so could not bend the large sheets. We used 6" strips, and made corners out of those. The corners were pop-riveted to the flat sheets. We scrounged up a couple of C-clamps and used the square tube metal railing as a bending jig. Olfa knife, a great idea. box of 50 blades for $7.00. They'll slice paper into thin strips of confetti, just like the sharpest knives I've ever used. The same pack of blades here costs $35.00. Pop-riveting two flat sheets together. Cutting a corner piece to length. Ono laid the pop rivet holes out very carefully and evenly spaced. Chimney connection, clean out, and small heated bench. bake oven on it. Should be interesting! (separate report coming soon). about 4 hours away by bus. mortar we had white thinset originally intended for plastering. It was very nice (see video below). Laying out oven arch bricks from Brian's template. Japanese finds. The hardware store had them in about 4 different size leads, and two brands including Mitsubishi. Brian and I bought a pile of them, as well as refills. My turn at the chop saw. Aki came up with this setup, and it actually worked a lot better than we were expecting. follow the curve of the bench backrest. at the farm supply and experimented. and pestle. The accelerated mortar was quite effective, with a long pot life and a quick set once it hit the brick. embedded in the slush as shown. 6" single wall chimney. Saves space, and exchanges heat to the convection space. Trying out the door for height. Another beautiful morning. We had great weather, and then some wet weather rolled in at the end. Spider damper, developed by Sleepy Hollow on Long Island. It is a drop in damper that sits on top of the chimney. A relief had to be cut into the bottom of the jack arch to accept the door flange. Setting up the jack arch. It will sit 3/4" proud of the face, flush with the arch form. The only way to mix mud. Setting the jack arch. It will get filled and pointed later. The red pavers also came in halves, conveniently strapped as shown. had also given us good advice "for travelling in heathen lands" ;-) to bring a trowel and a tape. prevent chafing of the stainless braided cable. Ono cut the hole in the pipe exactly so that the pipe could be threaded into it. There will be a second 90 degree elbow at the cable outlet. The pavers were also available as splits, in packs of 8 as shown. Because of the clearance issue with the ceiling beam, we capped the ceiling slabs on the core with sheet metal. Setting up the bake oven jack arch. Aki made us some nice wooden line blocks, that we kept as souvenirs. The arch bricks sit on the wooden part of the form. The cardboard is a guide for aligning the relief cuts. Two wild and crazy guys from Czechoslovakia. The steel cap for the chamber (not shown) will leave approx a 1" air space from the beam. 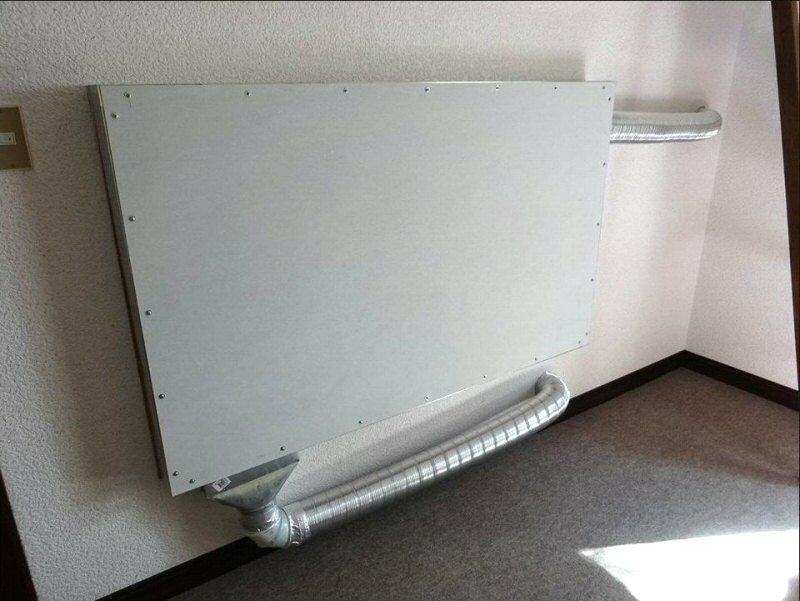 Due to space restrictions, the upstairs radiant panels will be supplied by a 4" duct with an inline variable speed fan. The warm supply air will be taken from above the ceiling slab. temperature initially, to ensure that no further protection of the beam is required. for the plate on top of the heater core. The treaded rods terminate about 1/2" below the beam, to allow the plate to slide in between and drop down. A second, heavier plate about 2" wide will run around the perimeter and will form the top of the seismic clamp. The threaded rods are epoxied into the foundation slab. A similar construction on the Wildacres triple-skin heater this year required sledge hammers for tear-down. EIFS mesh and thinset plaster. End of Brian's last day. Pretty close to done. Air slot detail at front of firebox. 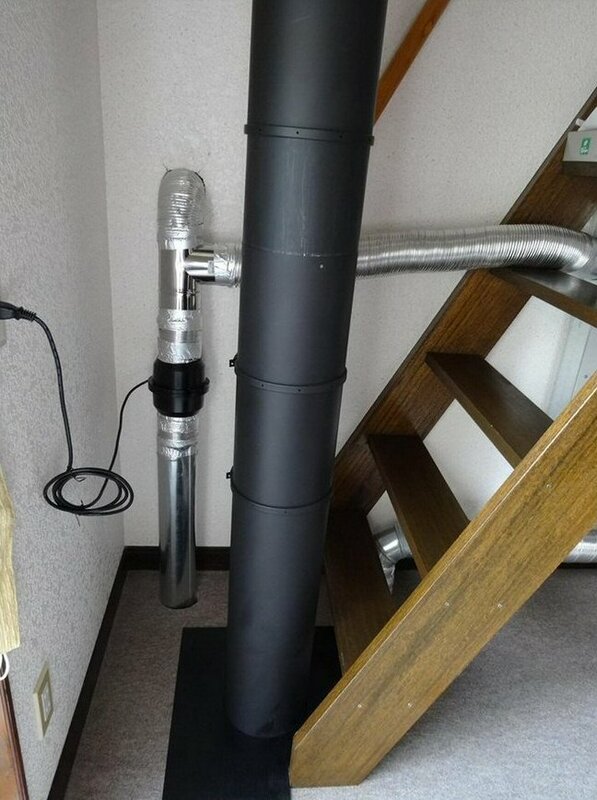 Ono installed the chimney. Note the super heavy duty flashing piece, required for the heavy snow loads in Nagano. 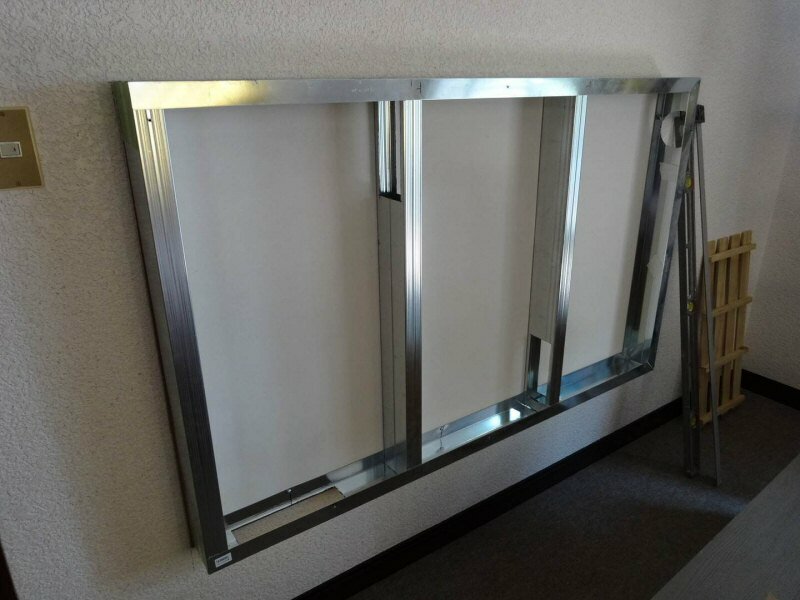 Top plate with reinforcing straps and CNC cut holes for chimney, warm air supply and return, and seismic hold down bolts. Top plate bolted in place. It is sealed to the heater with silicone. One of two upstairs bedroom radiant panels, framed with 50mm x 150mm metal studs. 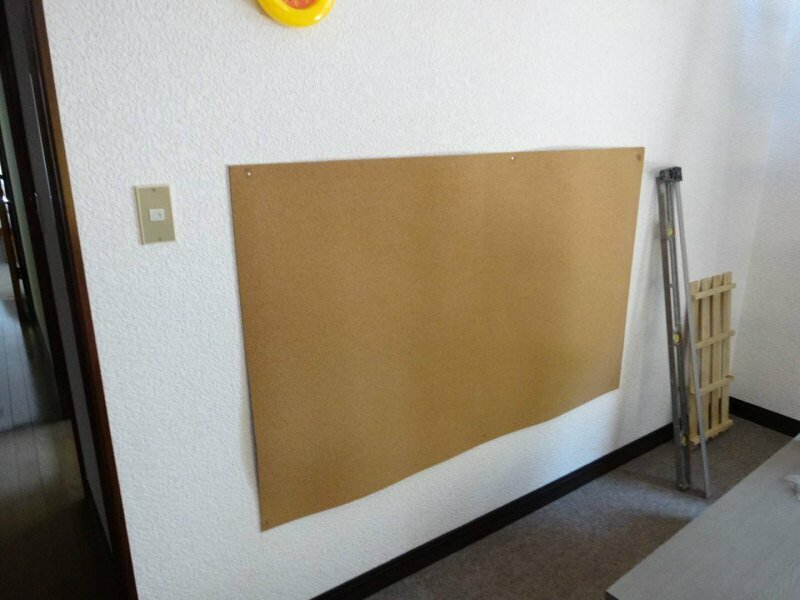 Cork insulation against the wall. 4" supply inlet at upper right. Return air slot on lower left. 4" ducts will be driven by an inline fan. 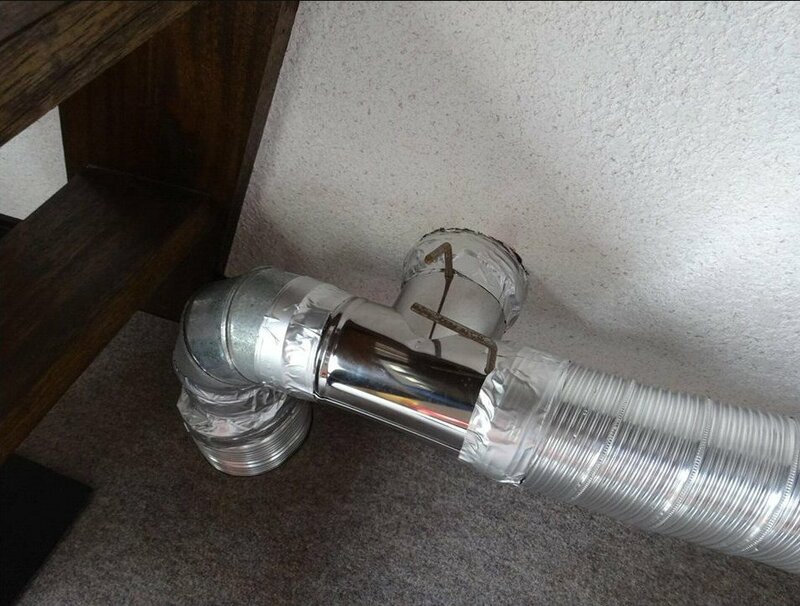 4" ducts will be used because of space restrictions. Zone dampers for the two panels. There will be a finish plaster coat, probably traditional Japanese plaster. The bench will get a wooden extension to the left.